Who doesn't love the theatrics and taste of a soufflé? I still remember times when I've had it for dessert when eating out. My husband and I had the best ones at The Four Seasons Restaurant and La Grenouille in New York City and we still talk about it now and then. 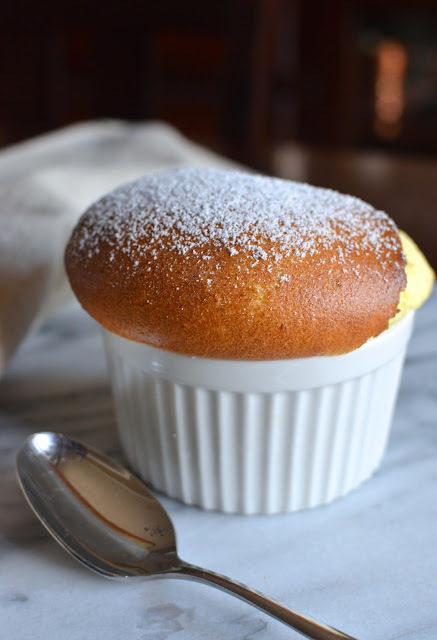 Thanks to this blog, I learned to make soufflé at home. Back in 2011, I started with a lemon soufflé. It wasn't nearly as difficult as I imagined and it was delicious - it's one of those things that kind of melts in your mouth and disappears quickly. And I gradually moved on...and tried chocolate soufflé (with orange crème anglaise), a chocolate version with Grand Marnier, as well as a plain Grand Marnier one. I've had different degrees of success. Over-whipping the egg whites seems to be my major problem but honestly, when you're not a professional or under the pressure of serving them to paying guests, imperfect soufflés are still really good! I don't know how restaurants manage to bring soufflés to the table while they're still tall and lofty; my attempts at home start deflating seconds out of the oven. When wintertime rolls around and the holidays approach, I tend to think about soufflés a lot. While I love to make and eat them, and I do make the ones I mentioned above occasionally, trying to photograph them to blog about is not so fun. But I was craving soufflé, particularly after looking through a holiday magazine and spotting an orange one (evidently, I have a thing for orange when it comes to soufflé), so I made it and tried to take some pics along the way. These soufflés rose and rose steadily in the oven, but this is the first time they've cracked as much as they did. Maybe I over-whipped my whites again, or I was too liberal with my liquid measurements, throwing in a little extra orange juice the way I did? I'm not sure, to be honest, and as much as I love a "neat" soufflé, there's something kind of endearing about a sloppy, overflowing one as well. I think so, anyway. I love digging right into the center with a spoon. It's steaming hot and so light and pillowy soft inside. It really is like eating some sort of sweet eggy clouds. In this case, these were bursting with orange flavor. A warm soufflé is really good with a cold crème anglaise sauce as a contrast but even without it, they are surely divine just on their own. Oftentimes, making a soufflé is basically a two-part process of making a quick pastry cream or custard and folding in separately whipped egg whites. The base of this one is made with milk, sugar, cornstarch, and egg yolks, flavored with fresh orange zest, juice, and some Grand Marnier (orange) liqueur, and finished with a smidgen of butter. Since I'm working with small volumes, I whipped the two egg whites by hand, hoping that will prevent over-whipping on my part. I find that if the whites are over-whipped (to the point where they start to clump and break), it actually prevents the soufflé from rising much in the oven. This is how it looked once the two parts were combined. Now on to portioning into individual ramekins. Can I tell you...this part always trips me up a bit because I often want to make individual size soufflés while recipes will dictate some specific size or other that doesn't work for me. In this case, for instance, the recipe (which I halved) was supposed to be baked in a 9 1/2 inch glass pie dish! I didn't want to make a big soufflé so I portioned it out into two 8-oz ramekins. Ramekin capacities always confuse me (I wish they were permanently labeled on to the dishes); mine would be 8-oz. if filled to the brim. I like to butter and then coat the inside of the ramekin with granulated sugar. Then I realized I had a little more batter leftover so I filled that into another, smaller (about 6-oz.) ramekin, shown below. The "extra" soufflé might not seem like it had much height but since it was only about 3/4 of the way filled, it lifted quite a bit in the oven. As for the other two, larger "main" soufflés, I grabbed them from the oven as fast as I could, dusted them quickly with powder sugar, ran them to the table, and was relieved I didn't break or drop anything in the process. A few quick snaps of the camera and then my husband and I sat down for a little soufflé break one recent afternoon. Now that's the life! Preheat oven to 400 degrees. Butter the inside of the ramekins and coat with granulated sugar, tapping out the excess. Place on top of a baking sheet and set aside. In a small saucepan, bring milk, 2 tablespoons sugar, cornstarch and zest to a boil over moderate heat, whisking constantly. Boil, whisking, for another minute. Remove saucepan from the heat and whisk in butter, orange juice and Grand Marnier until butter is melted. Then, whisk in the egg yolks. Transfer mixture to a large mixing bowl. Beat egg whites with the salt in a large bowl with an electric mixer (or by hand using a large whisk like I did). Whip until they just hold soft peaks. Gradually add the remaining 1 1/2 tablespoons sugar, whisking, until egg whites just reach stiff peaks. Fold one-fourth of the whites into the egg yolk mixture. Then, gently fold in the remaining egg whites until incorporated. Divide mixture among the prepared ramekins, filling nearly to the top and smoothing it evenly. Run your thumb along the inside rim of the ramekins (this is supposed to help the soufflé rise more evenly). Bake until puffed and golden, about 25 minutes. Remove from the oven, dust with confectioners' sugar and serve immediately (as soufflés will start to deflate quickly once removed from the oven). Wow Monica - If these are not perfect, then imperfection is the way to go - they are beautiful with lots of character and gorgeous colors. I can only imagine how wonderful they are to eat! Devour may be just the right term for what I would do to these! It looks so puffy and perfectly perfect, Monica. You certainly did an outstanding job! Aww...thanks. I feel like I managed and I really loved the sweet orange flavor of it. LOL! So true...the picture-taking was the hardest part! I think I'm more impressed that I didn't break anything, drop anything onto the floor, and took a few relatively decent pics of them in time. Hi Monica, you have really mastered souffles, these really look delicious, what a treat! Souffles (unless chocolate or cheese) are so "light" that you really would need at least 2 small ones! : ) They are a real special treat. 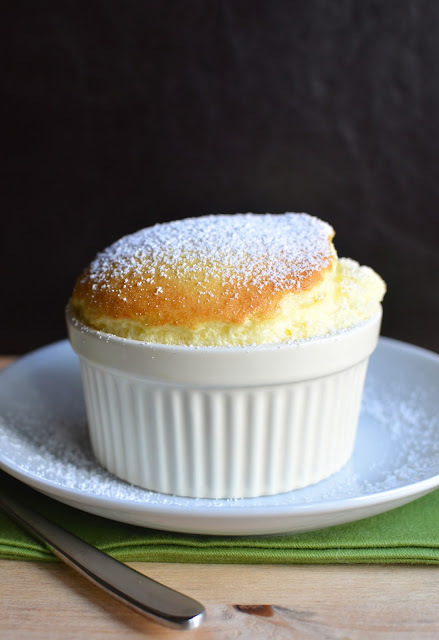 Soufflés are one of those things I have been meaning to try at home for the LONGEST time! I've had a handful of really amazing ones at restaurants and I'd love to be able to make them myself! This orange one looks fantastic Monica!! I actually really like the look of your souffles with the crackly surface. What a yummy creation! This is one reason why souffle has not appeared on my blog yet, photographing them is such a headache! Your orange souffle looks so soft and fluffy and delicious! Omg! I would love to dig into this souffle! Looks so perfectly risen and yummy! This is such an amazing looking souffle, Monica. Love how fluffy and delish it looks. 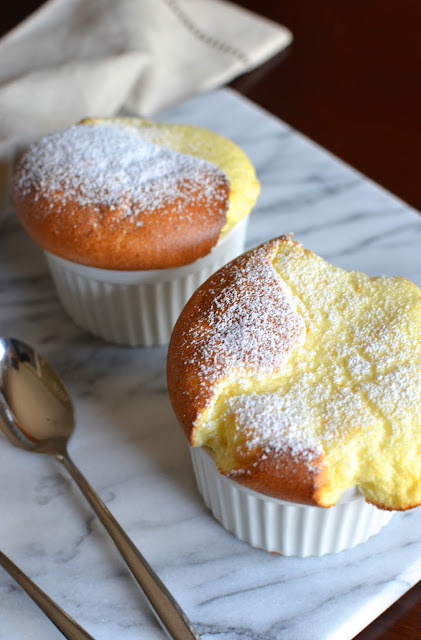 Citrus flavored souffles are the best. YUMMY! Thanks, Anu. It's the little things in life and I definitely appreciate a souffle from the kitchen. This looks absolutely perfect!!! I have never been brave enough to try a souffle at home! Thank you, Ashley. It's such a treat to have it out but it's actually not "hard" to make at home. : ) Hope you're having a nice weekend. Your souffles are gorgeous, Monica. Maybe you have something symmetrical as your ideal. But, your puffy, overflowing beauties are "rustic" (if something as glamorous as a souffle can be rustic) which has an appeal that makes it seem approachable as well as overflowing with delicousness. I can imagine the smell of orange filling your house as these baked. I am always amazed at how willing (and talented) you are to tackle recipes that many (i.e. ME) would be intimidated by! Ahh! I really am loving your writing style and of course, your baking style! This looks delicious and mouth watering! You got me so excited to try this one very soon! The citrus flavor for sweets is what I enjoy these days (or maybe years)... Not so crazy about chocolate as much (getting old?). Love the fluffy top! You got all my attention!! Two thumbs up!!! Hi Nami - thank you! I am still huge on chocolate but after that, I love simple cakes, cookies, desserts infused with some light, sweet, fresh citrus. I'm totally with you! I tend to like all things citrusy and your orange soufflés sound quite wonderful. All your tips are most welcomed as I never tried to make them before. I remember being in restaurants where it was always required to order a soufflé when ordering your dinner so that the timing would be prefect for presentation. I can imagine what would happen if they had to photograph them before sending them out to the table. Its so beautiful and perfect. Loved it!